Fort Fairfield – Larry O. Grass, 74, passed away Tuesday evening, January 29, 2019 at a Mars Hill healthcare facility, following a brief illness. He was born September 24, 1944 in San Antonio, Texas, the son of Owen K. and Pauline E. (Sears) Grass. He was a graduate of the Fort Fairfield High School, Class of 1962 and had been employed by the A & P Processing Plant, Potato Service, and McCain Foods as a fryer operator. Larry was a caring, charitable person who was a friend to all he met. 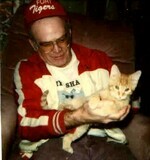 He enjoyed sports, animals, loved the Fort Fairfield community and was an avid supporter of Fort Fairfield sports, all teams, all ages. In addition to his parents, Larry was predeceased by one sister, Wendy J. Burns; two brothers, Dale N. and Greg K. Grass. He is survived by two brothers, James F. Grass and his wife Sharon of Presque Isle, Nicky E. Grass of Fort Fairfield; several nieces, nephews, and many friends to numerous to list. Friends may call Saturday February 2, 2019 from 7:00 to 9:00 p.m. at the Giberson-Dorsey Funeral Home 144, Main Street, Fort Fairfield. A graveside service will be conducted later in the spring at the Riverside Cemetery, Fort Fairfield. Those who wish may contribute in Larry’s memory to the Fort Fairfield Athletic Boosters, 28 High School Drive, Fort Fairfield, Maine 04742. Envelopes will be available at the funeral home. Online condolences may be expressed at www.gibersondorseyfuneralhome.com .